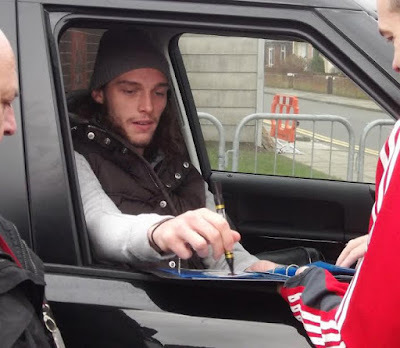 West Ham and England footballer Andy Carroll, 27, was on Wednesday threatened at gunpoint on his way home from training while driving his £100,000 Mercedes -Benz G-Class. Just minutes after leaving West Ham's Essex training ground, two bikers pulled up alongside the striker and then one of them pointed a gun at him. The striker, then immediately sped off in panic with the two bikers in heavy pursuit, but he managed to lose them. He immediately returned to the well secured Essex training ground. His team-mates were alarmed as they struggled to grasp his word while the club staff immediately rushed to his aid. The incident left the striker 'shaken' and the club have now confirmed the incident with plans to beef up security around the striker already underway.